﻿ France - Self-guided walking tour in Brittany-Walking towards the Pointe du Raz. 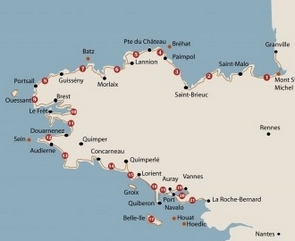 Independent walking tour - Western point of Brittany. Our local expert is based in Brittany and specializes in walking and biking trips along coastlines. Since 1992, they have been offering an authentic and intimate discovery of the maritime environment, with exceptional places to discover on foot or by bike. You walk from a place to another. We reserve the 2 and 3 star hotels, the breakfasts and the dinners, the luggage transfer and taxi transfer on the last day. Easy access if you come from Paris with the TGV. The landscape starts out ponds and wetlands and then rises slowly to turn into a series of cliffs that lead to the famous Pointe du Raz, genuine prow of the Old Continent. The Isle of Sein appears surrounded by the foam of the waves breaking on the encircling belt of rocks. 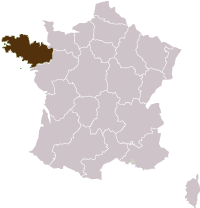 Arrive in Pont l’Abbé, the historical capital of “Bigouden country”, considered the heart of Brittany Spirit. The way leads you to the dramatic Trespassed Bay, the famous Pointe du Raz, the most westerly point of the French mainland .+400/-400m.18km (5h walk). After breakfast taxi transfer to Pont l’Abbé or Quimper. End of your stay. Possible extra night in Pont l'Abbé or Quimper if you wish to extend your stay. 895 € per person for 6 nights . From 15/04 to 30/06 and from 01/10 to 15/10. 860 € per person for 6 nights . 2 and 3 star hotels, double room occupancy. Boat crossing to Sein Island. Transfer on day 7 back to Pont l'Abbé or Quimper. The trip to Pont l'Abbé. Starts in : Pont l'Abbé. Ends in : Pont l'Abbé. Access : Quimper train station.